Fortunately you are starting off with a very strong assembly. Other then raising the compression all this work is for reliability and high rpm smoothness. As with the head section the items marked with an * are what we recommend for a performance buildup that can withstand 400hp reliably for drag racing. Endurance road race application with Rpm s over 7500 for any length of time require a different approach. If this is what you are doing with your car call us for details. Lightweight but extremely strong low expansion forged pistons in any oversize or compression ratio. 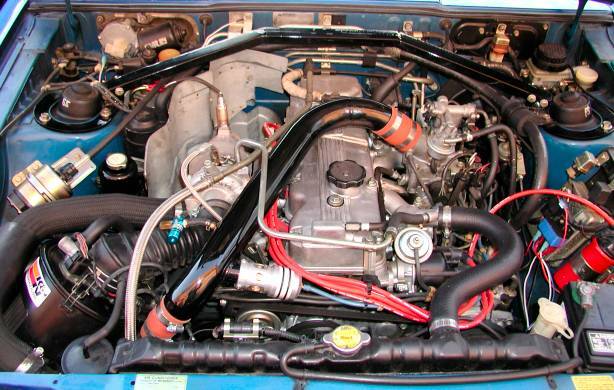 We use 8.0:1 +.040 overbore in all our engines unless someone wants a big bore or a stock compression engine. Complete with lightweight wrist pins and pin fit for floaters. Con rod small ends should be bushed for floater style wrist pins. The only real choice in piston rings. They cost a bit more but they work a lot better. Std bore, .020,.030,.040 overbore available. The stock rod is strong enough for almost any use once it is prepared. Shot peened, beam polished, resized big ends, small ends bushed for floaters, New rod bolts, magnafluxed, balanced.